I first fell in love with Austin Healeys in the mid-60's, something about them just said sports car! I bought my first Healey in 1977, a 1954 AH 100. I owned that car and other Healeys over the next 20+ years. 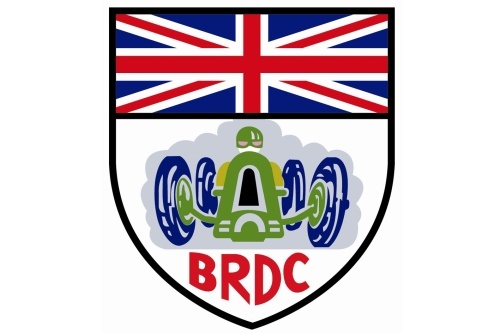 I had the great pleasure to know Donald, Geoff, Brian (Bic), Peter and John Healey and even though I no longer own one, the memories and great times I had with these cars and the people and friends associated with them, will always keep them in a special place for me. Here is our Healey collection, enjoy! 1954 100S Bonneville Streamliner: Donald Healey drove this special bodied 100S to a record 192.62 mph on the Salt Flats. The cars set four international class records with Donald Healey at the wheel. Donald M. Healey: 1898-1988: Noted British rally driver, automobile engineer, and speed record holder and of course, creator of Healey and Austin Healey automobiles. I always consider myself lucky to have made his acquaintance, he was one of the world's great gentlemen. 1948 Healey Elliott Saloon: The Healey Elliott sports saloon was produced from 1946 to 1950. The cars were built on a Healey chassis, with coachwork work produced by Samuel Elliott & Sons, from which the model took its name. Powered by a 2.4L Riley four-cyl. engine producing 100bhp, the car set a top speed of 110.8mph on the Belgian Jabbeke highway, making it the fastest series production car in the world at that time. Donald Healey soon had the car racing and this car has an extensive race history which includes the Spa 24 Hours in 1948 (8th overall, 2nd in class), the Mille Miglia, the Paris 12 Hours at Montlhery and at Goodwood in 1948. Nick Haines set fastest lap in the very first race at the Sussex circuit starting from the rear of the grid due to engine problems in practice, finishing 5th. The car is as raced at Goodwood. Model by J&M CLASSICS kit 1/43 1949 Healey Silverstone: Donald Healey and Ian Appleyard (the great Jaguar rally ace) drove a Silverstone to win the 1949 Alpine rally. The Silverstone was the first successful Healey production model and really is what allowed the development of the 100. Notice the waterfall grill, which carried over to the 100.Using their own chassis, but other makes components, the Silverstone is powered by a Riley 2.5-liter (2,443-cc) four-cylinder engine, four-speed gearbox, and rear axle from the Riley sedan. The Riley overhead unit was good for 104 horsepower. Model by K&R REPLICAS built kit 1/43 1950 Nash-Healey E: Following Donald Healey's agreement with George Mason to build cars powered by a Nash 3.8L straight-six engine, Healey took a modified Silverstone chassis wrapped with an envelope body to contest Le Mans in 1950. Driven by the duo of Tony Rolt and Duncan Hamilton, who would go on to win Le Mans for Jaguar in 1953, they finished 4th overall, 3rd in class. They had been running in 3rd place, but had to slow their pace in order to preserve their brakes and transmission. This allowed the Allard J2 to pass them four laps from the finish. Model by BIZARRE 1/43 1952 Nash-Healey Le Mans: Pierre Veyron and Yves Giraud-Cabantous drove this entry at Le Mans in 1952. They retired in the 3rd hour of the race due to a faulty gearbox and were classified 50th overall. A total of four Nash-Healey lightweight cars were made to run at Le Mans, three roadster versions and one coupe. This car was rebodied using the 1950 Le Mans Silverstone chassis. Nash-Healeys ran at Le Mans for four years between 1950-53, with excellent finishes each year (4th-1950; 6th-1951; 3rd-1952 and 11th-1953). 1952 Nash-Healey Le Mans: To create a racing pedigree for the marque Donald Healey built four lightweight Nash-Healeys for endurance racing. This car driven by Leslie Johnson and Tommy Wisdom took third overall behind two factory-entered Mercedes-Benz 300SLs; the Healey also took first in class. Like the road cars, they had Nash 4.0L six-cylinder engines (power output was increased by fitting higher-compression aluminum cylinder heads, special manifolds and twin SU carburettors), and the cars had spartan, lightweight aluminum racing bodies. The race cars looked completely different from the production Nash-Healeys, none of which ever competed at Le Mans. Model by BIZARRE 1/43 1952 Healey Tickford: Donald Healey started making cars under his own name after the end of WWII. Using a Riley 2.4L engine ad drive train mounted in a Healey designed chassis, Healey turned out low production, elegant sports touring cars with coach built bodies. 222 Tickfords were built between 1950-1953 and the 106 bhp engine could propel the car to over 100 mph for comfortable continental touring. Bill Meredith-Owen entered his Tickford, co-driven by Alec Pitts, in the 1953 Monte Carlo Rallye, one of 404 entries that year. Model by OXFORD 1/43 1953 Nash-Healey Spider: Gerry Coker designed the open body of the new NashHealey race cars for the Mille Miglia and Le Mans in 1953. Two cars (X14 & X15) were built and this was the single Nash Healey entry in the Mille Miglia, with John Fitch and Healey mechanic Ray Willday driving. The rear axle failed on the car early in the race. Both cars were entered at Le Mans, with one finishing in 11th place, the other retiring. The cut away body work in front gave better cooling to the front brakes, with the long tail providing better stability at speed. These were the last Nash Healey racing cars built. 1954 Nash-Healey: Produced primarily for the American market between 1951 and 1954, the Nash Healey was a collaberation between Donald Healey and Nash CEO George Mason. The two met on the Queen Elizabeth and discovered during their talks on the voyage in route to America, that building an upscale two-seater using Nash running gear was a great concept that would benefit both automakers. Using a Nash inline six-cylinder 3.85 L engine with Healey designed chassis and cylinder head, coupled to a 3-speed manual transmission with overdrive, the new car developed 125 hp. In 1952 the body was redesigned by Pinin Farina. Production ended due to high production and shipping costs, along with the companies taking different directions. Healey of course was now preoccupied with the Austin Healey 100, but it has to make you think that collaberation happened because of the collaberation with Nash before it. 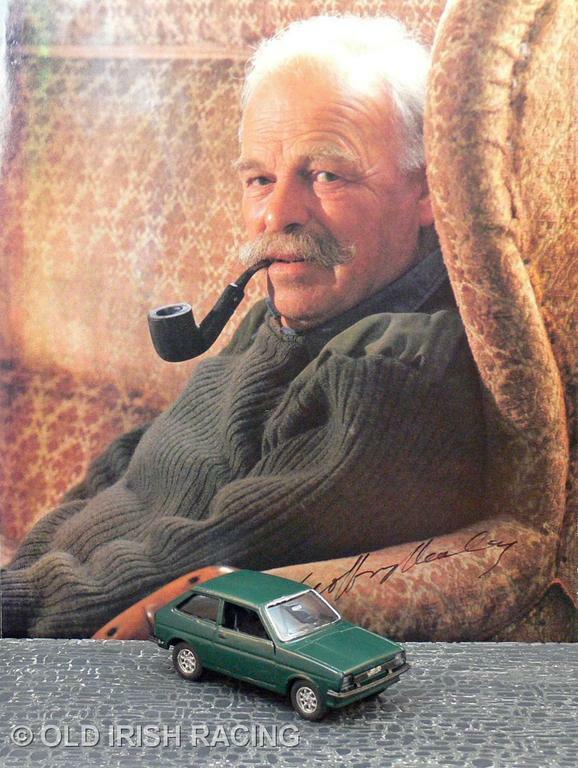 1977 Healey Fiesta: Ford tapped Donald and Geoffrey Healey for the project that would take a stock Fiesta and enhance its performance and handling. They managed to turn the anemic 1.6L four-cyl, engine producing 66 hp into a 105 hp performance machine, with handling to match. A roll bar helped stiffen the chassis and it an even more purposeful boy racer look. Unfortunately, they could not find a market for modified Fiestas and this was the only one ever built. 1953 100: Maurice Gatsonides and Johnny Lockett in the inaugural appearance by an Austin Healey at Le Mans in 1953, finished in 12th place. This would be the beginning of a long appearance at Le Mans by Austin Healeys. Powered by the stock Austin 2,600 cc 4-cyl. engine, the cars that raced at Le Mans in 1953 were basically stock units. Both cars entered finished, attesting to the reliability and durability of the then new Austin Healey. Model by SPARK 1/43 1953 100 : The other half of the '53 Le Mans team, Marcel Becquart and Gordon Wilkins drove this car to 14th place. With alloy bodies and largely stock 2.6L 4-cylinder engines, producing 100+ bhp, this car was doing very well until a balky overdrive cost the team time and positions. This is one of four special test cars, two which raced at Le Mans and two which ultimately went to Bonneville for speed and endurance record breaking. Model by SPARK 1/43 1954 100S Prototype : At Sebring in 1954, the 100S prototype was driven by Lance Macklin and George Huntoon to 3rd place overall (1st in class) after engine trouble late in the race prevented the car from finishing a convincing 2nd. Using the four-cylinder 100bhp engine to later appear in the 100S production cars, and utilizing its "new" disc brakes, it was faster than the Lancia D24 and that placed 2nd and may have won outright if rain had not given the advantage to Stirling Moss' OSCA. 1954 100: I had this large 1/8 scale model made by Charles Matthews, of the beloved 100 I owned for more than twenty years. Accurate in every detail, while its not as good as having the real car back again, its close! 1954 100S: Two of the five special test cars were entered in the 1954 Carrera Panamericana road race in Mexico. Donald Healey and Lance Macklin drove this car (SPL258BN), but exited the race early with ignition problems. This car subsequently was raced in 1955 at Sebring & the Mille Miglia with Stirling Moss and Macklin and again at Nassau Moss driving. Model by K&R REPLICAS 1/43 1954 100S: The second team car on the 1954 Carrera Panamericana was driven by Carroll Shelby and Ray Jackson-Moore. At the 175km mark, Shelby hit a large rock and flipped the car four times, breaking his arm and sustaining other injuries. The car (SPL 256BN) was written off, but was rebuilt in the 1990's. It is thought that partially because of Shelby's accident, it was the last Carrera. Model by K&R REPLICAS 1/43 1955 100S: Given the deep rallying tradition of Donald Healey, it was no surprise that the 100S was used, even if it was not best suited for this type of motorsport. Because Triumph was doing well in International rallies, BMC entered this 100S for Peter Reece and Dennis Scott in the 3,000 mile Liege-Sofia-Liege rally. Unfortunately, they crashed soon after the start and were forced out of the rally. 1954 100 BN1: I repainted this model almost 30 years ago, to look like my own car at the time, using part of the actual interior material for the tonneau. The 1953 thru early '55 AH 100's were model designated BN1. The most notable feature aside from the 3-speed with O/D, was the front fender, which had a higher front fender wheel arch than the latter models. My car had the full Le Mans kit. Model by CORGI 1/43 1954 100S Prototype: One of the 100S prototypes ran at Bonneville in 1954, building on endurance and speed records achieved the year before. A replica was reconstructed around this car and ran at Bonneville once again in 2009, achieving almost 128 mph in its demonstration run. The original run in 1954 produced 132 mph and set 24 hour and 5,000 km records. Drivers were Carroll Shelby and Roy Jackson Moore. Model by K&R REPLICAS (factory built) 1/43 1955 100 BN2: Refinement of the 100 led to the BN2 series of cars in 1955 & '56. BN2 cars received a 4-speed gearbox, allowing the cars easier to be driven more sportingly and more within the expectations of the motoring public. The BN2 also had slightly larger brakes. Living up to its name, the 100 could easily top 100 mph, a major accomplishment in its day. 1955 100S: Development of limited production competition car began in 1954. Using new Dunlop disc brakes and further development of the 100 bhp engines with special heads and other refinements continued. 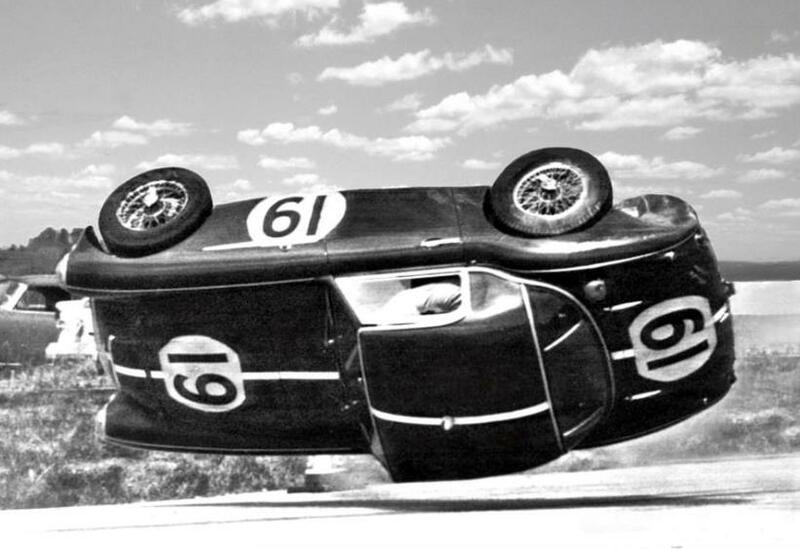 A prototype ran at Sebring in '54, finishing third. This success resulted in the "S" designation for the new model in 1955, the 100S. Only ` and , with Only 55 were built, most in lobelia blue over white. 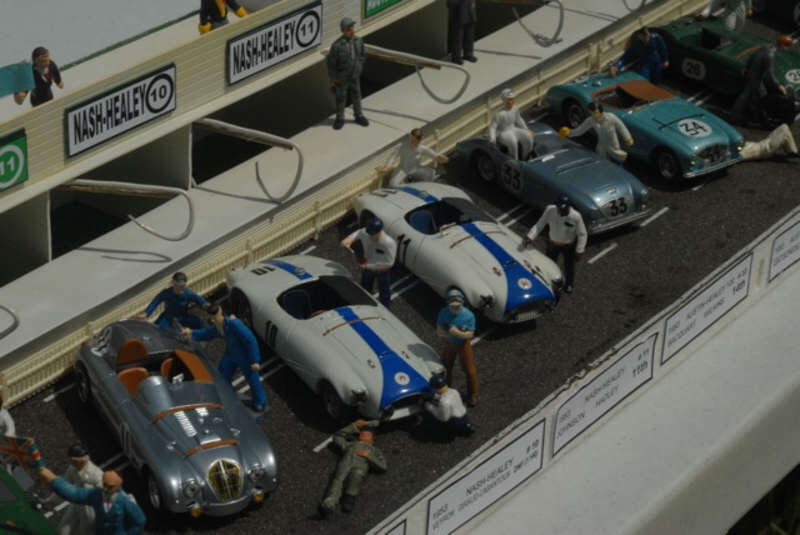 Model by SPARK 1/43 1955 100S: Misfortune overtook the Healey team at Le Mans in 1955. This 100S being driven by Lance Macklin was struck from behind by the Mercedes 300 SLR driven by Pierre Levegh across from the pits and the result was the horrific tragedy that took over 90 lives and the tragedy forced much needed change in auto racing safety for driver and spectator alike. Model by SPARK 1/43 Le Mans & Sebring: 1954 BN1 Le Mans and 1955 100S. Click on the photo and you will see a picture of these two cars side by side in 1/1 scale. The photo was taken at the International Austin Healey Meet at Snomass, CO in July 1982. My car was known as the "prototype", nicknamed such by 100S expert Steve Pike. The Le Mans kit was later offered on some production cars as the 100M. 1954 100 BN1: Introduced at the 1952 Earls Court Motor Show, the Healey 100 took the show by storm with its svelte, low-slung good looks, it really was unlike any production car in existence at the time. It has to be one of the classic sports car designs of all time. A deal with Austin made during the show to produce the car resulted in the Austin Healey. Dinky was one of the first toy makers to capitalize on the new car. Model by DINKY 1/43 1956 100 BN2: This is a more modern version and realistic version of the original Dinky 100, but still very toy-like. Model by DINKY 1/43 Austin Healey Delivery: Here is a representation of a delivery of cars to a dealer in the mid-50's. Corgi made a replica of the 100 along with Dinky, and these cars are all the last of many of both I have had in my collection over the years. Two I've owned since I was a boy. I like older toys that have been lovingly played with, they have history and patina mint boxed stuff never will. 1956 100 BN2: A well played with Corgi. Model by CORGI 1/43 1954 100 BN1: The view most Triumph owners saw! Model by DINKY 1/43 1956 100 BN2: Another one rescued from the toy box. 1955 100 BN2: One of the unique features of the 100 was the fact that the windshield could be lowered into a lay-down, or "racing" position. That was the way I usually drove mine over the 20+ years I owned it, usually only going to the upright position if it rained. Rarely did the top go up and I think I used the side curtains once for the comfort of a woman that was riding with me. Great fun! Model by DEL PRADO 1/43 1953 100 BN1: A plastic friction drive car produced in plastic and made in Hong Kong. The interesting thing about this car is that the rear is all wrong for a production car. However, the front and rear do closely resemble one of the prototypes. Curious. I bought this toy at a toy show in about 1980 for the princely sum of $3, the tag is still on the bottom. Click on the photo to see the rear view. Model by AGRESPOLY 1/32 1953 100 BN1: I am unable to find any marking on this tin-litho 100. I found this one in 1982 and at that time there weren't many 100 replicas so it was a must have. A crude toy and based on the litho printing, base, etc. it looks to me to be more modern than 50's or early 60's. Probably late 70's and east European (then Soviet bloc?) Just a guess. 1956 100 BN2: Having restored, owned and driven a 100 for over 20 years, they are very special cars to me. I see what restored versions are going for now and think back to a time when they were under appreciated and a small group of us that owned and drove the snot out of them knew the true meaning of "sports car" and rubbed elbows with the men that made them! Model by DINKY 1/43 1956 100 BN2: I saw the real car this was modelled after at a show in the early 80's. It was painted a non-original bright yellow and had several modifications from stock. I was chagrined when it appeared in the pages of Road&Track as a featured car, even more so when it was made in miniature. Model by DANBURY MINT 1/36 1954 100S Coupe: In 1953, Donald Healey had his designer Gerry Coker pen a couple of prototype coupe concepts around the Austin Healey 100, with the idea of making a production coupe to join the two seat roadster. That never happened, but Healey chose this coupe as his personal car. It was not only his personal car, but was also used as a test bed for potential improvements to the production cars. This coupe received the new 100S mechanicals, including the 100S engine (2.6L 4-cylinder) producing 132 bhp, along with 100S disc brakes and transmission. Originally with a black top, the car was repainted all red during Healeys ownership. Donald Healey used the car extensively until 1962, when it was advertised for sale and axquired into a private collection, not changing hands until sold at auction in 2015 for just under $900K USD. Model by SPARK 1/43 : Geoff Healey with my 100 at the International Healey Meet, Snomass, Colorado - July 1982. 1957 100-6 BN4: The new 100-6 made use of the six-cylinder 2,639 cc engine, as the 4-cylinder was being phased out of production. Despite the lighter, larger engine, the new model lacked the same performance as the 100. The new model designated BN4 did feature two rear occasional seats which appealed to enthusiasts with young families. Model by ERTL 1/18 1957 100-6 BN4: Perhaps one of the first scale model kits of an Austin Healey, I built this well over 40 years ago. Model by AURORA 1/32 1957 100-6 BN4: Tommy Wisdom and Cecil Winby took 1st in class, at the 1957 Mille Miglia in this car. A new 6-port head and larger HD6 carburetors were fitted to boost horse power and performance. This became available on production cars and was known as the "MM" or just "M" head. 1958 100-6 BN6: The 100-6 also was available as a classic two-seat roadster (BN6) in 1958-59 in limited numbers. I built this model sometime in the late 60's after I had become infatuated with Healeys. Model by STROMBECKER 1/24 1958 100-6 BN6: Of the number of these large tinplate cars over the years that I have traded or sold, I held on to this one. Missing its top, I just love this scruffy old toy. It reminds me of some real Healeys I've owned. 1960 3000 BT7: Introduced in 1959, the 3000 featured a larger 2.9L six-cyl. engine and had much livelier performance than the model it replaced. Originally offered as either a 2-seater (BN7), or a 2+2-seater (BT7), the early 3000's were retro designated the Mark I. Model by CORGI 1/43 1960 3000 BN7: A removable factory hard top made the Big Healey a proper GT car and versatility for the owner that used their car year round. As with many convertibles that have optional hard tops or coupe versions, in my opinion they enhance the looks of the car. Model by CORGI 1/43 1960 3000 BT7: The 3000 was a true roadster with side curtains and a removable soft top. Roll up windows and stowable tops would not be introduced on the Big Healey until late 1962 with the Mk II model. 1960 3000 BN7: The successful team of Pat Moss and Anne Wisdom won their first European Championship rally on the 1960 Liege-Rome-Liege. The 3000 proving to be strong and reliable for rally events, achieved the success in rallying that eluded Healey teams in circuit racing. Moss/Wisdom were two of the best! These cars used triple carbs and stronger gearboxes and rear-ends, two years before they found their way into production cars. 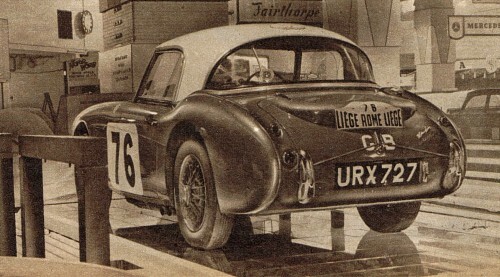 1960 3000 BN7: The team of Vic Elford and David Siegle-Morris drove one of the three BMC prepared 3000's on the Liege-Rome-Liege rally, finishing 5th overall and 2nd in GT Class. Teammate Pat Moss was the winning driver on the rally with her navigator Ann Wisdom. The Marathon De La Route as its known is a grueling 3,000 mile rally over Europe's worst roads. In 1961 the route was changed and it became the Liege-Sofia-Liege rally. 1960 3000 BN7 : Five 3000's were prepared for Sebring by the Healey works team, at Warwick. This car (UJB 141), is one of the three identical looking BMC team cars that ran the 12 hour race, the fourth was prepared for the Canadian Austin Dealers and the fifth was a spare. Driven by John Colgate and Fred Spross had a spectacular accident and rolled the car several times. It was subsequently purchased some years later and restored by our friend Bill Bolton. 1960 3000 BN7: Entered for Sebring in 1960 with its two BMC sister cars, UJB 143 finished 3rd in class and 33rd overall with Jack Sears and Peter Riley at the wheel. This was the first race outing for the new 3000, with Le Mans and Sebring being the two major races the team entered in 1960. The third team car finished 15th, 2nd in class. It is interesting how close to the actual production cars the race cars were. They had 25 gal. fuel tanks and disc brakes, but were otherwise mostly standard. Model by CORGI 1/43 1960 3000 BN7: After Sebring, UJB 143 was raced at Le Mans in 1960 again with Sears & Riley, but failed to finish due to engine problems. It was sold by the works after the race and re-registered DD300 and was run at Le Mans in both 1961 and 1962, where it retired both times. It went on to become perhaps the most famous of all the "works" cars through the ownership of John Chatham. Its interesting to note that besides running at Le Mans two more times, it was also used in two rallies by BMC. 1960 3000 BN7: DD300 as entered for Le Mans in 1961 under the ownership of David Dixon under the Ecurie Chiltern banner. Drivers were John Bekaert and Richard 'Dickie' Stoop and they were forced to retire in the 23rd hour due to a blown head gasket. In 1962 it was driven by Bob Olthoff and Sir John Whitmore. They retired while in eighth place with six hours to go due to piston failure. Model by VITESSE 1/43 1960 3000 BN7: A more detailed version of the 1961 Le Mans entry. This car has probably had the longest continuous competition history of any Healey, absolutely the most notable. After Sebring, then Le Mans it was a Modsport racer, restored and raced in club and vintage events by John Chatham, up to today and the Le Mans Retrospectives. Model by SPARK 1/43 1960 3000 BN7: This is DD300 as it competed for the last time at Le Mans in 1962. Whitmore and Olthoff driving under the Ecurie Chiltern banner had brought the car from 24th to 8th before it retired in the 19th hour, classified in 22nd position. Raced at Sebring and three times at Le Mans, it is still racing in vintage events and Le Mans retrospectives today. Model by SPARK 1/43 1960 3000 BN7: Base signed by the legendary John Chatham. 1960 3000 BN7: The famous UJB 143/DD300 as it raced at Sebring in 1960 and Le Mans 1960-1962. 1960 3000 BN7: From the beginning, Austin Healeys were raced and the 3000 was no exception. While not a huge success in international circuit racing at a time when prototype racing really took center stage (especially Le Mans) the 3000 was successful in amateur racing. Healeys dominated SCCA racing in the States and club racing in England in their respective classes. This is a model I built in the sixties of a D Production 3000. Model by REVELL 1/24 1960 3000 BN7: Another version of the Moss/Wisdom rally champion. Healeys are still campaigned today in vintage and historic racing and rallying, as I can attest from my involvement with the Purple Lips Racing Team in the late 90's. Model by SPARK 1/43 1961 3000 BN7: Known as the Sinke Healey, this Netherlands based car is entered in the Le Mans Classic regularly and does well in its class. The car is owned by Rinus Sinke and was driven in the 2006 Le Mans Classic by Rinus along with Jaap Sinke and Hans Van De Kerkhof. 1960 3000 BN7: Works rally cars used triple carbs and stronger gearboxes and rear-ends, two years before they found their way into production cars. This is an older replica of the Moss/Wisdom Liege rally car. Pat Moss was unquestionably one of the most successful Healey drivers. From 23 events she gained 11 class wins and 14 Ladies awards, including two championships. Model by CORGI 1/43 1960 3000 BT7: Primrose yellow is one of my favorite Healey colors. It seems to show off the lines of the car well. The half open tonneau on this car reminds me of many drives taken in my cars on crisp Fall days, or the first nice days of Spring. Toasty! Model by CORGI 1/43 1961 3000 MkII BN7: Without bumpers, any Healey looks a lot more purposeful! There has never been a glut of Healey models and when these were introduced in the 80's they were snapped up by enthusiasts as well as model collectors. Crude by today's standards, most of the mass produced 1/43 models currently available still have a "toy like" quality. Maybe Spark or IXO will make a production Big Healey. 1962 3000 MkII BT7: In 1962, the triple-carb version of the 3000 was introduced. It was only produced that year and to many Healey enthusiasts, the two-seater version of this car which was produced in very low numbers, is the holy grail of 3000 production. In 1962 a transmission change went from the archaic side-shift to a center shift transmission. Hot and uncomfortable on long drives in the summer, nothing beats the burble and sound of a 3000's exhaust. Model by ERTL 1/18 1962 3000 MkII BT7: These were one of the first attempts at a limited run of models back in the 80's. Its all too common now, but these actually had the number hot-stamped into the plastic base. They featured gold tone rather than chrome plated trim. The exact number is lost to me now (a few hundred? ), but this is #016 and was one of the ones produced with no top. The one next door with a top is #402. Model by VITESSE 1/43 1962 3000 MkII BT7: One of the best parts of owning a Healey in the 70's and 80's was the fact that cars were plentiful and cheap! We drove the hell out of our cars and used them as they were intended. Not that they aren't enjoyed today, just not with the same abandon. We were also lucky to have Donald and Geoff still with us. Having the Healey family directly involved in the club scene was one of the rare opportunities to actually have a chat with the man that was directly responsible for the car you enjoy and love so much. Priceless! 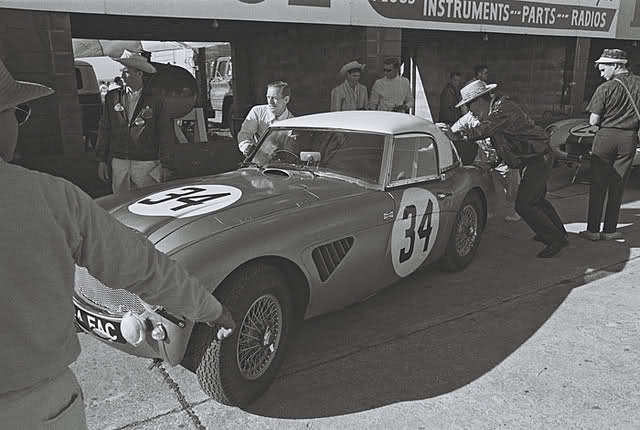 1963 3000 Sebring: 54 FAC is one of three cars pulled off the production line to be modifies by Donald Healey Motot Co. for Sebring in 1963. Paddy Hopkirk and Donald Morley drove this car and finished 26th overall and 4th in class behind their sister car (56 FAC) which finished 12th overall. Oil starvation at speed kept Hopkirk and Morley from being able to drive this car at full speed. Had it been able to lap competitively during the race, it may have placed in the top ten. 1964 3000 MkIII BJ8: The 3000 was constantly being refined and the MkIII was the final version before production ended in 1967. Roll-up windows, stowable top, walnut dash facia, it was a proper touring car with the most comfort of any Big Healey. More importantly, it also had more power, with a different cam shaft and two 2-inch SU carbs and braking power through a vacuum servo. In late 1964, the Phase Two version was introduced, which increased ground clearance by an inch among some other "improvements". This is a Phase One version. Model by KYOSHO 1/18 1964 3000 MkIII BJ8: I included this picture, because this was my car and one of the 1,390 Stage One (Phase One) versions made. I never cared for the look of the separate parking/turn signal lamps or the way the rear-end sits higher on a Phase Two car. This was an original, low mileage example that everyone thought I was nuts to have paid $8,000 for in 1988. Wish I could buy a couple in this condition for that now! It is currently under-going a restoration by its current owner. I think Kyosho used my car as their inspiration! Model by AUSTIN HEALEY 1/1 1964 3000 MkIII 'BJ8: Rauno Aaltonen and Tony Ambrose won the 1964 Spa-Sofia-Liege or Marathon Rally outright. It was the last of the great Marathon's and the last time a full team of 3000's would be entered for an international event. They won by a margin of over 30 minutes. In standard trim, the rally Healeys were capable of over 150 mph, however the top end speed was not need for rallying. Instead lower axle ratios almost cut the top speed in half, but the acceleration in exchange was incredible. 1964 3000 MkIII BJ8: Paddy Hopkirk and Henry Lidden won the Alpine Rally in 1964, one of five rally wins for the Big Healeys. Lidden is perhaps the most successful of the BMC co-drivers and Hopkirk BMC's best driver. Model by KYOSHO 1/18 1964 3000 MkIII BJ8: The rally car model is signed by Irish driver Paddy Hopkirk, who for 30 years was the world's most famous rally driver. We are proud to have one of his signed pieces in our collection. Model by KYOSHO 1/18 AH 3000 : I found this little nipper in a gift shop in Florida. Its 1 of 2 I made in commemoration or Oregon's 12-0 perfect season in 2010 and a trip the 2011 BCS Championship game. GO DUCKS!!! 1958 Sprite: The Sprite was created to make people happy! The business purpose was to create a small, low cost sports car in the BMC range. The end result was a cheerful looking little two seater, powered by an Austin A35 engine of 948 cc and produced 40 bhp. Nicknamed the Frogeye on the British side of the Atlantic and Bugeye in the USA, owing to its frontal appearance, the delightful little car made sporting motoring affordable for thousands. Relished today in almost cult-like status, the Bugeye is one great car! Model by K&R REPLICAS (built kit) 1/43 1959 Sprinzel Sprite: To say that John Sprinzel was instrumental in helping develop the Sprite for competition would be a mild understatement. He was principally the developer of racing and rallying Sprites with his Speedwell company producing many racing and rally champions. Sprinzel won the British Rally Championship in 1959 and Sprites took the first 3 places in thier class at Sebring in 1959. Sprinzel sold Speedwell in 1959 and became Donald Healey's Speed Equipment Division where Sprites were further developed for international racing. Sprinzel's personal race and rally cars carried the registration number PMO200. John Sprinzel and Willy Cave finished 14th overall and third in class in this car on the 1959 Monte Carlo Rallye. Model by SPARK 1/43 1960 Sprite: Almost from the beginning, Sprites were campaigned in smaller bore auto racing. Using variations of the original A-series engine up to 1275 cc, the Sprite has been a successful class racer. In SCCA racing in the US, full grids of Sprites made for very entertaining racing and are still campaigned vigorously today in vintage racing. Famous drivers piloted Sprites at some point in their career. Stirling Moss, Pedro Rodriguez, Innes Ireland, Steve McQueen, Paddy Hopkirk, Bruce McLaren, John Colgate, John Harris, Pat Moss,and Peter Riley to name a few. Model by ALTAYA 1/43 1961 Sebring Sprite: The Healey Team at Warwick built a new enclosed bodywork Sprite for Le Mans in 1961. The car was driven by regular team driver John Colgate and Paul Hawkins and experienced racing driver and mechanic. Healey also built a Sprite coupe for Ecurie Ecosse to run at Le Mans that year as well. The Sprite was powered by one of the four-cylinder Sebring Sprite engines of just under 1.0L at 994cc. and was built on the same chassis they ran at Le Mans in 1960, winning their class. After 60 laps at Le Mans, the car was retired with a holed piston. It was determined that there was not sufficient time to make repairs and still cover the required distance before the car would have been disqualified, so reluctantly it was withdrawn while in 41st position overall and second in class. 1961 Sprinzel Sebring Sprite: John Sprinzel produced a light alloy body on the basic Sprite understructure, with Harry Westlake tuned engines. Used in rallying with success at both the RAC and Liege-Rome-Liege rallies, they were also entered in circuit races, particularly Sebring, hence the name. In 1961, Stirling Moss drove this car to 4th place in the 4 hour race, finishing behind Bruce McLaren in another Sprinzel Sprite and ahead of most of the factory work Sprites. Model by HISTORIC SPORTS RACING 1/43 1961 Sebring Sprite: The Le Mans winning Ecurie Ecosse team was nearing the end of its run when David Murray talked Donald Healey into letting him "borrow"one of their works Sprites at Le Mans in 1961. Why they chose a Sprite to run alongside their Cooper Monaco is a subject left for speculation. The Sprite was one of the works cars that has run at the Sebring 4-hour race that year, finishing 3rd with Walt Hansgen at the wheel. According to Geoff Healey, the 948 cc engined Sprite had a longer fiberglass nose fit for Le Mans, but otherwise other than being pained in Ecosse blue, remained as run at Sebring. 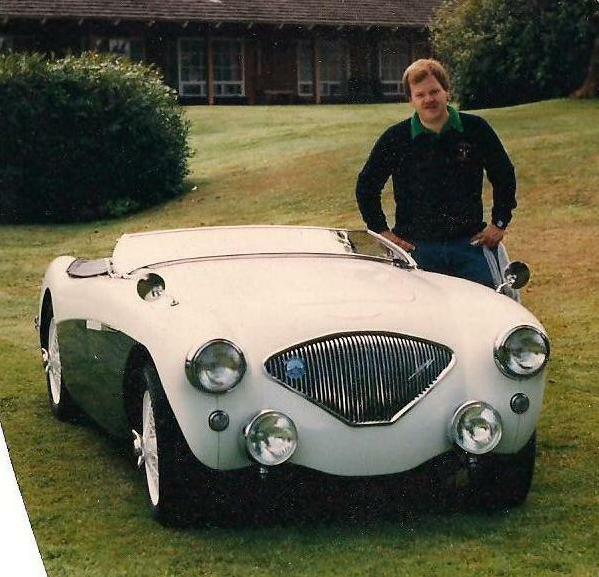 Le Mans winner Ninian Sanderson was joined by William MacKay to pilot the Healey. In heavey rain, MacKay crashed at White House on the 40th lap of the race, taking the Healey out early in the race. Model by SPARK 1/43 1962 Sprite MkII: The success of the Sprite led to the creation of a successor to the Bugeye in 1961, which could share the badging with MG. This gave both the Morris and Austin branches in BMC a entry level sports car. Dubbed the MkII, the car was given a face-lift of a squarer body, which made it look more contemporary, with a larger 1098 cc engine. The "square-body" Sprites and MG Midgets were produced into the 1970's. Model by DINKY 1/43 1964 Sprite MkII: This is an H Production Sprite, typical of the later Sprites campaigned in SCCA and club racing across America. The particulars of this car are lost to me now. It says 1978 on the bottom of the model, so I am unsure if this car was a class winner in the SCCA Run-Offs that year or not. I remember seeing large grids of HP cars in the late 70's and the racing was both intense and fun to watch. 1965 Sebring Sprite: Paul Hawkins and John Rhodes drove this Sprite to a 12th place finish at Le Mans in 1965. The 1.3L Sprite was in the same classification as the race winning Ferrari 250LM/275LM and Porsche 904/6LM, acquitting themselves very well against much more powerful competition. This was the first of four successive Sprite two-car team entries by Donald Healey at Le Mans and was the best overall finish of these mighty litle cars at Le Mans. Model by BIZZARE 1/43 1965 Sebring Sprite: Rally great Rauno Aaltonen and works driver Clive Baker drove the second Healey entry at Le Mans in 1965. Their race finished in the 22nd hour due to a broken gearbox, but would have finished 2nd in class behind the other Sprite had it gone the distance. Using the same engine used to power the Mini-Cooper S, the Sebring Sprites delivered a top speed of 148 mph, mostly due to the slippery shape of the cars first tried at Sebring in 1965. Model by BIZARRE 1/43 1966 Le Mans Sprite: John Rhodes and Clive Baker retired after the 16th hour due to clutch and engine problems at Le Mans in 1966. These aerodynamic Sprites had aluminum alloy bodies, 1293 cc engines and could do a top speed of 150 mph. These cars were used in 1965, '66, '67 & '68 in basically the same form. In '67 Healeys won the Motor Trophy for being the first British car (15th) and again took 15th in 1968 with the fuel injected car now producing 120 bhp. Model by BIZARRE 1/43 1966 Le Mans Sprite: Paddy Hopkirk and Andrew Hedges were the pilots of this Healey entry at Le Mans in 1966. It outlasted its sister car by just over 100 laps, retiring in the 20th hour due to head gasket failure while in 15th position. The 1966 Le Mans Sprites were the only ones to have overdrive, which was a Laycock MGB unit. This in effect gave six-gears and allowed the 1.3L cars to touch 150mph on the Mulsanne Straight, but considerably off the pace of the winning Ford GT40's. 1967 Le Mans Sprite: Clive Baker and Andrew Hedges were the pilots of the Donald Healey Motor Co. entry at Le Mans in 1967. The Healey was beaten in its 1.3L class by the Alpine-Renault A210's. For 1967, the Sprite had bigger brakes with front/rear bias adjustment and a new gearbox fashioned from an MGB unit and had a tall 5th gear, allowing a 101 mph average lap speed. After starting 50th, the car finished in 15th position. 1968 Le Mans Sprite: Roger Enever and Alec Poole drove the Donald Healey entry at Le Mans in 1968. They finished 15th overall, the car running without problems for the full 24 hours. This car (HAN9-R-238) was one of the last 12 Sebring/Le Mans Sprites built and was given Lucas fuel injection and a modified MGB gearbox with had a 5th gear. After Le Mans, the car under new ownership was raced at Sebring in 1969 and both Daytona and Sebring in 1970 (1st in class at Sebring). 1968 Healey SR Climax: If looks alone could make a car go fast, this car would have been a rocket! Unfortunately, powered by a 2.0L Climax V8 it had promise, but was too slow to effectively beat the larger engined, faster competition of the day. Envisioned by Donald & Geoff Healey to be a overall Le Mans winner, sadly, the car retired in the 3rd hour due to clutch problems. Purpose built for Le Mans, this car is a beautiful collaboration between Geoff and designer Barry Bilbie. Clive Baker and Andrew Hedges were the drivers in 1968. 1969 Healey SR Climax: For 1969, the SR's changes to the front intakes and position of the oil and water radiators gave the car a lower body line and better front/rear balance. Again, the car looked promising. Clive Baker returned to the Healey team in '69 and was joined by our friend John Harris as co-pilot. In the 4th hour, caught up in the aftermath of an accident, the car overheated and lost coolant, which regulations dictated couldn�t be replaced. It wasn�t long before the SR had to be retired. The Healey run at Le Mans in a all British built entry was the last of its kind. 1970 Healey Repco XR37: For Le Mans in 1970, the top came off the SR, a 3.0L Repco V8 was added in place of the Climax V8 and it became the XR37. While it was no match for the might of the Porsche 917's, it did prove to be competitive under endurance race conditions. Andrew Hedges and Roger Enever ran as high as 10th before having to spend long pit stops for clutch and accident repair. While in 14th position the Healey's engine expired 14 minutes from race end. The car survives today in Australia. 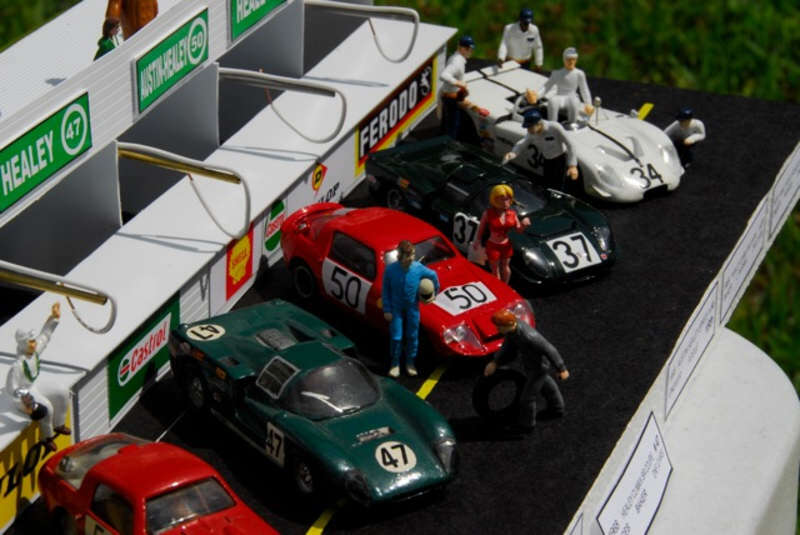 Model by SPARK 1/43 : David Matthews who is writing a book on the Healey SR and XR37 was a tremendous help in giving me guidance on the XR37 as it ran at Le Mans in 1970, along with invaluable assistance in how Healey got the car there. XR37 was towed to Le Mans behind a borrowed Austin Westminster sedan and trailer. How Healey got all their mechanics, spares, tools, etc. to Le Mans is a wonder and all the more spectacular their achievement!. Thanks also to David for assistance in the correctness of the Hedges and Enever figures. 1950-60's AH Transporter: I don't have and don't recall seeing a picture of a Healey transporter, but they had to get the cars to the track somehow. BMC prepared the rally cars, so they would have used BMC transporters. Donald Healey Motor Co. prepared the cars for the circuit track races and would have hauled the works entries. Any more information would be appreciated. Model by BREKINA 1/87 Small Scale Healeys: Here is a grouping of small scale Austin Healeys. There is a Lindburg plastic kit BJ8 model in 1/64, a Schuco 100-6 in 1/87, a Morris & Stone 100 in 1/64 with box and an unknown 3000 in plastic 1/87. Because of its appealing shape and reputation, there were many Healey toys made in many scales and materials, some more realistic than others. Model by MISC More Small 100's: I remember in the 60's when you could buy a bag of small plastic cars at the dime store (remember those?) that contained many multi-colored cars of the day, including some fairly exotic ones. Made in England, I am unsure of the manufacturer, but here are three examples I have found in approximately 1/87 scale. A Dinky 100 is used for reference of size. Austin Healey Memorabilia: Various Austin Healey Items I have obtained over the years. 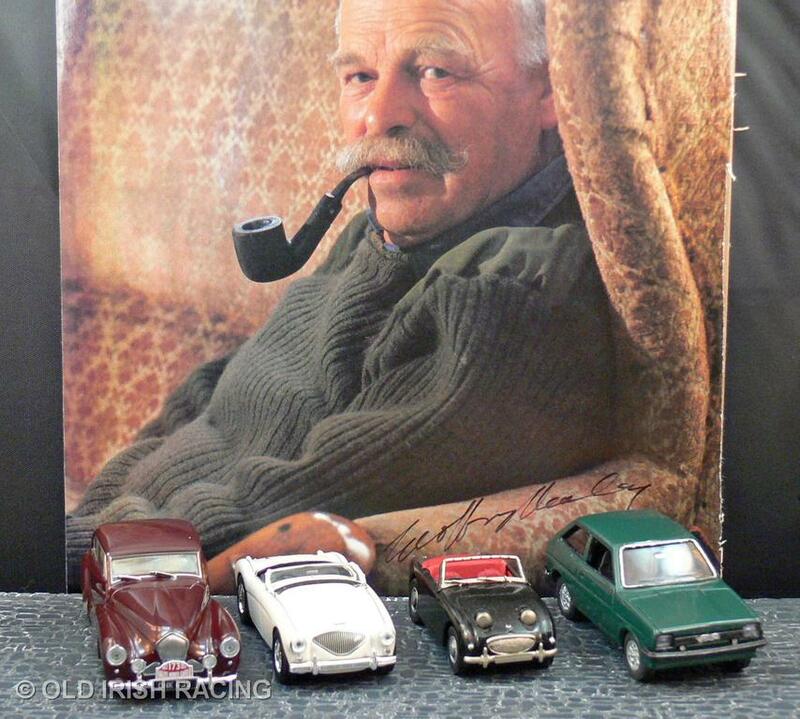 Austin Healey Memorabilia: More of the pieces obtained over the past 30+ years. Austin Healey Memorabilia: Some are hidden, but I have obtained a number of club patches over the years. The Geoffrey Healey Books: Original editions of the first three books Geoff wrote. 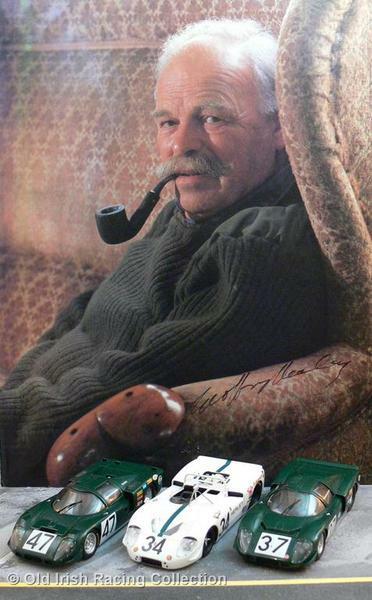 The photo of him is one of my favorites and appeared in Classic & Sports Car magazine. Margot said it was hers too. Autographs: One of the prime objectives of any Healey nut, was to get everything Healey signed and I did! Autographs: Geoff always took the time to make sure he personalized each book he signed. Autographs: I had Bic sign this photo in Geoff's original book. It was the inspiration for me in painting my 100 and what we used to try and match color too. Autographs: My original copy of this book went AWOL some years ago, but I did have another signed copy in my stacks, so all was not lost, if just not personalized. Books: "Happy Healying" there was no better slogan that said it any better! The article is one I wrote for the Portland All-British Field Meet when AH was the featured marque in 1987. "Record Setting with Donald Healey": Alan Neis did this watercolor in 1979 of Donald Healey driving the 100S prototype in which he helped set a number of endurance run records at Bonneville in 1954. Signed by Donald Healey in 1981 during a visit to us in Salem, OR. Original watercolor approx. 26"x 21" framed. "Sebring at Le Mans": This is a rare signed Nicholas Watts print of the 100S driven by Lance Macklin at Le Mans in 1955. It features the D-Jag of Hawthorne, the MB 300 SLR of Fangio and the Ferrari 121LM of Trignant about to pass the Healey. Somewhat controversial given the tragedy about to unfold. 30"x38" framed. ABFM Gold: Perhaps of the awards I received with my Austin Healeys, my favorite was the gold medal received at the Portland All-British Field Meet with my 1954 100, when Austin Healey was the featured marque in 1987. That was on of the last times I showed the 100, amid some very stiff competition, it was a nice reward. 1960 3000: After Le Mans, DD300 was eventually acquired by John Chatham and raced successfully by John in England and abroad. Here is DD300 as it was raced at Le Mans in 1960, with the plinth signed by John Chatham. Model by SPARK 1/43 "World Wide Austin Healeys": I made this van for my friend David Matthews who has World Wide Austin Healeys in the UK. David is an expert on many things Healey, especially the SR Climax/XR37. Scale 1/43 1959 100-6: This is my conversion of what a period 100-6 sports racer would look like in the early 1960's. Healeys and Austin Healeys at Le Mans 1949-1970: These are not part of my collection, but that of our friend, Healey owner, expert and model collector extrodinaire, Bill Emerson. I wanted to include them here, because this display of all the Healeys and Austin Healeys which turned a wheel in competition at Le Mans is simply fantastic! 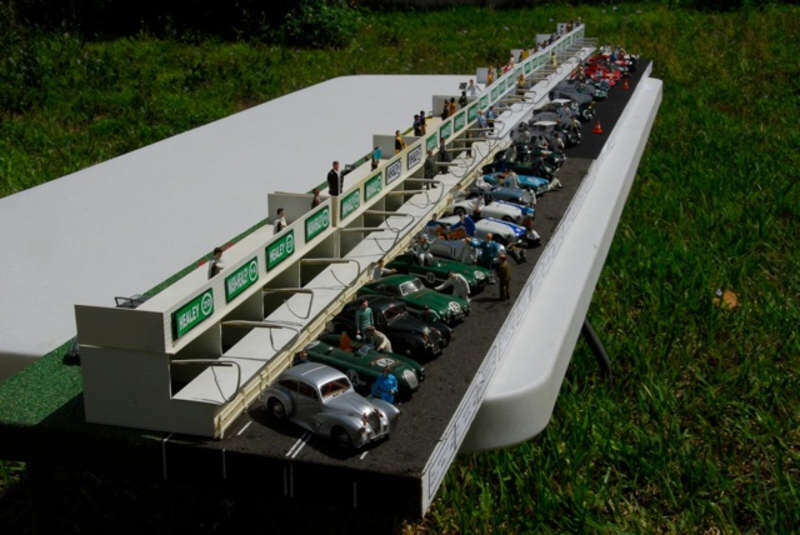 Bill has created this diorama of vintage Le Mans pits, which is over 6' long. Every model (save two which have not been modelled yet) are there. Simply fantastic and makes me very envious!!! Bill has now donated this diorama to the Healey Museum in the Netherlands where it is on display for more enthusiasts to enjoy! 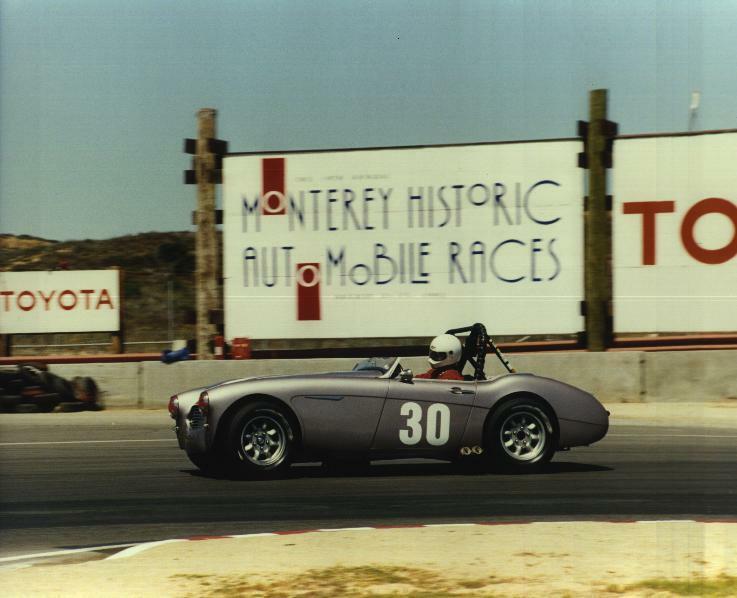 Purple Lips Racing AH 3000: For over 10 years I was a part of the Purple Lips Racing Team and we campaigned this car on the West Coast USA in vintage racing events. Click HERE to go to our webpage on the internationally famous Purple Lips Racing Team.